BACKGROUND AND PURPOSE: Although first-choice therapy for the ranula is surgery, this choice presents technical difficulties and frequent recurrences because of insufficient surgery. We evaluated the efficacy of OK-432 sclerosis of the plunging ranula as a substitute for surgery. METHODS: Twenty-one patients with plunging ranula were treated with intralesional injection of OK-432. The liquid content of the ranula was aspirated as much as possible, after which OK-432 solution was injected in the same volumes as that drawn out. Patients were followed on sonography or CT. RESULTS: Seven (33.3%) patients with plunging ranulas showed total shrinkage and resolution, and 4 (19%) patients showed near-total shrinkage (more than 90% of the volume). Four (19%) patients revealed marked shrinkage (more than 70% of the volume), and 3 (14.3%) patients showed partial shrinkage (less than 70% of the volume). Three (14.3%) patients showed recurrence after total shrinkage 1 month after injection. The overall recurrence rate after each injection was 47% (16 of 34 injections in 21 patients), but the recurrence rate after the last sclerotherapy was only 14%. There were no serious side effects except for fever lasting 2–3 days (12 patients) and swelling (10 patients) for 3–5 days. Mild odynophagia for 1–2 days was also noted in 7 patients, and there was 1 severe case of odynophagia. CONCLUSION: OK-432 sclerotherapy of plunging ranula is a safe and potentially curative procedure that may be used as a primary treatment for plunging ranula before considering surgery. To the best of our knowledge, sclerotherapy of plunging ranula treated with OK-432 is rare; only a few case reports7–9 and original reports10,12 have described OK-432 injection of the ranula as effective treatment. To date, a large series of OK-432 sclerotherapy for plunging ranula has not been reported. The purpose of this study is to assess the effectiveness of OK-432 sclerotherapy after long-term follow-up and whether it might become the primary treatment and a substitute for surgery for treatment of plunging ranula. Between March 2001 and October 2004, 21 plunging ranulas were treated by intracystic injection of OK-432 solution. Five simple ranulas were not included in this study because of their small number and their small size. All study patients were initially treated with OK-432 injection before surgery. The study patients ranged from 7 to 43 years of age (mean, 20.8 years). There were 13 male patients and 8 female patients. All patients presented with swelling in the neck area of several months’ duration. The diagnosis was made clinically, radiologically (CT and sonography), and by needle aspiration biopsy. All patients were treated on an outpatient basis. Sclerosis of cysts was performed in the following manner. Before injection of OK-432, we asked the patients whether they had a history of penicillin allergy or hypersensitivity. All study patients had no history of penicillin allergy and hypersensitivity. Each cyst was punctured under sonography guidance after povidone-iodine (Betadine) preparation on the skin superficial to the cyst. Picibanil (1 KE [The Klinische Einheit (KE) is used to express the dosage of preparation; 1 KE of OK-432 contains 0.1 mg of dried cocci], Chugai Pharmaceutical Co. Ltd, Tokyo, Japan) powder was dissolved with 10 mL normal saline and drawn into a 10-mL syringe (0.1 KE/mL). Under sonography guidance, a 20-gauge intravascular catheter (D&B-CATH; Gumi, Gyeongbook, South Korea) or a 21-gauge needle was then placed in the center of the cyst. Care was taken not to go too far medially and to avoid puncturing the back wall of the cyst. When the needle tip was located in the middle of the cyst on sonography, fluid aspiration was performed and the liquid content of the cyst was aspirated as much as possible. The angiocatheter or needle was left in place, and the syringe was removed. The syringe with the OK-432 solution was then attached to the angiocatheter or needle, and a volume equal to that removed was slowly injected into the cyst under sonography guidance to avoid extracystic injection of the solution. The angiocatheter and syringe were then removed and a bandage was applied to the puncture site which was gently compressed for 10 minutes. We avoided puncturing the ranula through the oral mucosa because leakage of the solution was noted via the puncture route when we treated simple ranula. After sclerotherapy, we regularly monitored the effectiveness of the sclerotherapy by sonography or CT at 1 month, 3 months, and 6 months, respectively. After 6 months, we periodically scanned the cyst on sonography for long-term follow-up. We also clinically followed the cyst, which was collapsed or not, by noting patient’s symptoms and on physical examination. The follow-up period after the last sclerotherapy ranged from 6 to 43 months (mean, 14.3 months). The percentage of volume reduction was determined by comparing measurement of the plunging ranula on the initial and postsclerotherapy sonograms and CT scans. The lesion volume was calculated by means of the prolate ellipse formula (V = 1/2 length × width × thickness). The results were considered as “total shrinkage” when the plunging ranula was undetectable on sonography or CT. The results indicated “near total shrinkage” when a volume reduction of 90% or more was depicted on follow-up sonography or CT. The results were considered to indicate “marked shrinkage” when a volume reduction of more than 70% was depicted on follow-up sonography or CT. The results were considered to indicate “partial shrinkage” when a volume reduction of less than 70% was depicted on follow-up sonography or CT. When the ranula recurred, we again regularly scanned the cyst for more than 6 months after the last sclerotherapy. On the first month’s visit, we questioned the patient about whether there had been fever, tenderness of the injected cystic area, swelling, and odynophagia. We also questioned the duration of the symptoms. Our results are reported in the Table 1. Total shrinkage without recurrence was noted in 7 (33.3%) patients (Fig 1) after only one injection, and near-total shrinkage was noted in 4 (19%) patients (Fig 2) after one injection. Four (19%) patients showed marked shrinkage (Fig 3) after 1–2 injections (mean, 1.5 injections), and 3 (14.3%) patients showed partial shrinkage (Fig 4) after the last injection (mean, 3 injections). Recurrence after the last injection (mean, 1.7 injections) was observed in 3 (14.3%) patients after total and near-total shrinkage. Case 18. A 29-year-old man with severe left submandibular swelling shows total shrinkage after a single OK-432 injection. A and B, Initial contrast-enhanced CT scan shows a large plunging ranula in the left sublingual (arrows) and submandibular spaces (arrowheads) with extending to the upper neck. C and D, Follow-up postcontrast CT scan obtained 6 months after OK-432 sclerotherapy depicts total shrinkage of the plunging ranula. Case 1. A 21-year-old woman with a slow-growing mass in the right sublingual area shows near-total shrinkage after a single OK-432 injection. A, Contrast-enhanced CT scan shows a large cystic lesion (arrows) in the right submandibular space. B, Follow-up CT scan obtained 2 months after OK-432 sclerotherapy shows nearly total shrinkage of the plunging ranula (arrows). C, Follow-up sonogram obtained 43 months after OK-432 sclerotherapy shows 2 small residual cystic lesions (arrows) in the right submandibular space. They represent less than 5% of the original volume of the cyst. Case 2. A 24-year-old man with tender swelling in the right submandibular area shows marked shrinkage after 2 OK-432 injections. A, Contrast-enhanced CT scan shows a plunging ranula in the right submandibular space (arrows). B, Contrast-enhanced CT scan obtained 2 months after the first sclerotherapy shows near total shrinkage of the plunging ranula (arrow), but the 3-month follow-up sonogram showed enlargement of the cyst. C, Unenhanced CT scan obtained 3 years after the second injection shows marked shrinkage of the cyst (which was larger than after first injection) (arrow). Case 3. A 10-year-old boy with sublingual swelling shows partial shrinkage after 3 OK-432 injections. A and B, The initial contrast-enhanced CT scan shows cystic lesions in the right sublingual space (arrows) and submental space (arrowheads). C and D, Unenhanced CT scan taken 2 months after the first sclerotherapy, depicts disappearance of the cyst in the right sublingual space (arrow), but a cyst remains in the submental space (arrowheads). The ranula in the submental space recurred after its complete shrinkage after the next 2 OK-432 injections. The overall recurrence rate after each injection was 47% (16 of 34 injections in 21 patients), but the recurrence rate after the last sclerotherapy was only 14.3%. In one of the patients with a partially shrunken ranula (case 3), the cyst in the right sublingual space was collapsed, but the cyst in the submental space remained (Fig 4). This patient showed near total shrinkage of the remaining cyst in the submental space on the next 2 injections, but the cyst recurred 2 months after each sclerotherapy. One partially shrunken ranula (case 5) was injected 5 times, and the cyst disappeared for 1 or 2 months after each injection but then recurred. The ranula in case 13 (Fig 5) was drained for 5 days by pigtail catheter insertion. After 10 days, OK-432 was injected in the remaining cyst, which then collapsed and resolved. Ranula recurrence always happened within 2 months of sclerotherapy. The recurrence time after each repeated injection, which was done in 7 patients, was 1–3 months (mean, 1.3 months) after total or marked shrinkage. Of the 3 patients with recurrence after the last sclerotherapy, 2 underwent surgery and one chose observation. One of the patients who underwent surgery was eventually cured, but in the other patient, a ranula recurred in the opposite side of the submandibular space. Case 13. A 20-year-old man with tender swelling in the left submandibular area. 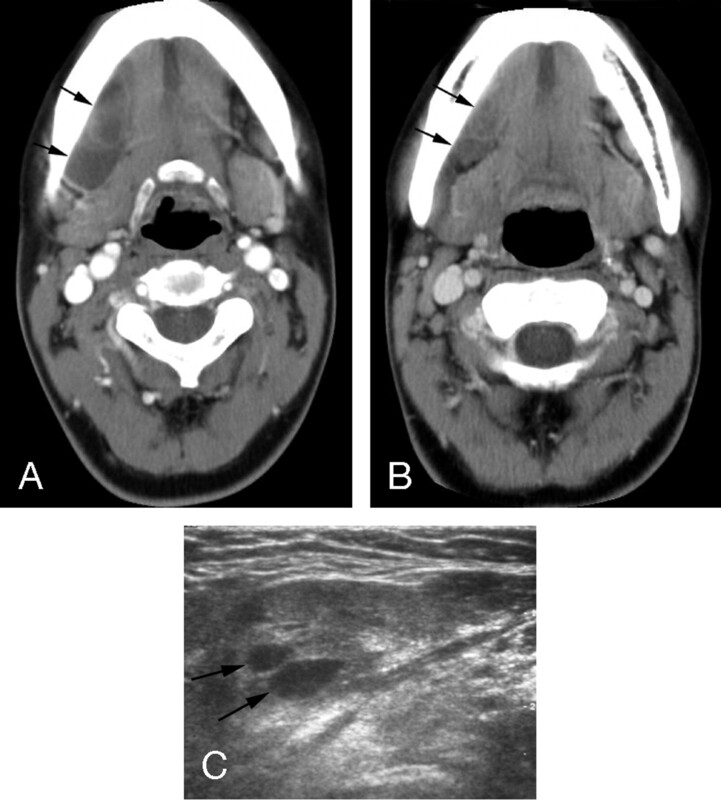 A and B, Initial enhanced CT scan shows multilocular, rim-enhancing cystic lesions in the right sublingual and submandibular space (arrows) with adjacent soft tissue infiltration and swelling (arrowheads). This abscess-like lesion was drained by pigtail catheter for 5 days. OK-432 sclerotherapy was performed 10 days after the pigtail catheter drainage of the plunging ranula. C and D, Follow-up transverse and longitudinal sonograms obtained 11 months after OK-432 sclerotherapy shows complete shrinkage of the cystic lesion in the right sublingual space (arrowheads) and submandibular space (arrows). Twelve patients complained of fever for the 2–3 days after injection of the OK-432 solution, and 10 patients showed swelling of the cyst for 1 week after OK-432 injection. Mild odynophagia was also noted in 7 patients. However, no serious complications were noted except for one severe swallowing difficulty after sclerotherapy because of extracystic injection of the solution. This patient required admission for treatment (case 9). A plunging ranula is similar to a cystic lymphangioma in that it has a very thin wall. In view of the effectiveness of OK-432 for treating the latter type of cyst, one would expect that OK-432 might also be effective for treating a ranula. Fukase et al10 attempted OK-432 sclerotherapy in 32 cases of ranula, including simple and plunging ranula, and concluded that it is safe and can be used as a substitute for surgery. Especially for all 11 cases of plunging ranula, OK-432 injection was curative. Five cases of plunging ranulas were cured by only one OK-432 injection. Three cases were cured after 2 OK-432 injections, and 3 cases were cured after 3 injections. However, in our series, only 7 (33.3%) cases showed total shrinkage and 4 (19%) cases showed near-total shrinkage after only one injection. Four (19%) cases revealed marked shrinkage, 3 (14%) cases showed partial shrinkage, and 3 (14%) cases recurred. Our cure rate was low (33.3%) compared with that in the Fukase series (100%), and all of the 7 totally shrunken cases in our series were injected only once. The reason for the different results in our study may be related to a different concentration of OK-432 solution when a second or third injection was needed. Fukase et al10 used a more concentrated (50% increase) OK-432 solution if a second or third injection was done when a recurrence was noted, but we used the same solution concentration. However, a major factor may be our sonography or CT follow-up rather than the clinical follow-up in their series. In our series, most marked and partial shrunken cysts, as well as near-total cysts, were not seen or felt during the follow-up period. In our patients, most recurrences happened within 1–2 months after complete or marked shrinkage of the ranula, which occurred between 2 and 3 months after each injection. The ideal time to evaluate whether therapy has been effective is approximately 4 weeks after OK-432 administration.8 We also believe that the time to check the recurrence is during the 2–3 months after shrinkage. The first advantage of sonography-guided sclerotherapy is that a greater amount of secretion of the ranula can be aspirated by showing and adjusting the needle tip within the cyst rather than by using blind aspiration. The second advantage is prevention of extracystic injection of the OK-432 solution, because we can see that the injected solution is whirling within the cyst when the solution is injected and that the collapsed cyst is re-enlarging to its original size. If extracystic injection is seen on the sonogram, the injection should be stopped immediately and the needle tip repositioned in the cyst, after which injection may be continued. As seen in our results (case 9), extracystic injection of the solution causes severe swallowing difficulty because of soft tissue swelling of the parapharyngeal space and tenderness in the injected space. Finally, a small cyst that is not palpable can be effectively aspirated under sonography guidance. The complication rate of sclerotherapy is minimal, as seen in the Fukase series.10 In our series, minor discomforts, such as fever and swelling at the injection site, were usually seen within the first few days after injection. Fever disappeared within 2–3 days, and tender swelling decreased within 1 week after injection. Only one patient was admitted to the hospital as a result of swallowing difficulties and discomfort caused by extracystic injection of the OK-432 solution around the parapharyngeal soft tissue, as this led to parapharyngeal soft tissue swelling. Surgery of a plunging ranula is a complicated procedure that leaves some residual lesion and the chance for recurrence. However, OK-432 sclerotherapy does not require patient admission and leaves no scar on the skin at the injection site. Sclerotherapy is economically and cosmetically more advantageous than surgery. Because sclerotherapy causes a cyst to collapse rather than to disappear completely, these patients should be monitored regularly over the long term (more than 6 months) and should undergo repeat sclerotherapy if a cyst recurs. Our results suggest that OK-432 injection of plunging ranulas is a safe and effective therapy that results in complete or a significant decrease in the volume of these cysts, despite some incidence of recurrence. This therapy is a potentially curative procedure that may be used as a primary treatment and the treatment of choice for plunging ranula before considering surgery.